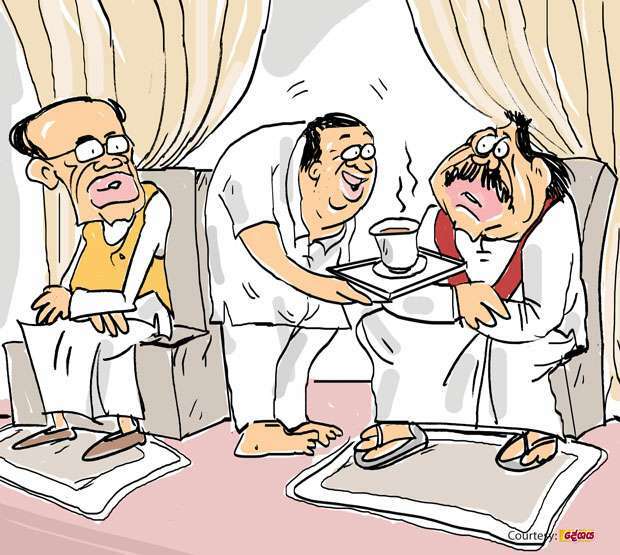 Daily Mirror - A hiccup over a tea cup! A hiccup over a tea cup! There was a large crowd of mourners at the Medamulana mahagedara when Number One arrived there the other day to pay his last respects to the departed Rajapaksa family member. He was warmly welcomed by his former big boss, the former Speaker and others of the bereaved family. After paying his last respects to the departed, Number One was chatting with family members and friends when he was invited to tea. According to the security rules being observed, all food and drinks meant for Number One should pass through his security personnel. So, the security men themselves prepared the tea for Number One, placed the cup on a platter and gave it to a domestic aide to be offered to Number One. The domestic aide who headed where the special guests were seated, respectfully offered the cup to the former strongman. The former strongman, who found himself in a tricky situation, straight-faced nevertheless, put aside the cup. Number One too rising to the occasion promptly helped himself to a cup among those ready for the other guests! Later highly disconcerted Number One’s security men recorded a statement from the domestic aide responsible for the breach of both security rule and etiquette. And this reply had stumped the security men who had left without doing any further questioning, they say.